Through a series of inventive and cogent gestures and placements Michael Joo has responded to and shaped the 100-year-old industrial space where Surviving Sandy took place. He incorporates the track lighting installed for the show into his piece Untitled (Impacted). He also lowers the piece an additional five-and-a-half-feet to the same height of the Herkimer diamond that is partially buried in the wall. In this way it simultaneously illuminates, impedes, and alters the crystal’s relation to the wall through a demarcated incursion of space. Michael Joo, “Untitled (Herkimer Unfolded),” 2009. Silicone rubber, polyurethane, wood, 47 x 59 x 30″. Courtesy of the artist. Photo by Zack Garlitos. In the opposite corner is Untitled (Herkimer Unfolded), a mold for an enlargement of an actual Herkimer diamond—large enough for a person to curl up inside of. It is propped against the floor and wall with two by fours, and one of its sections is hinged open ready to receive. In this way—open and empty—the most obvious purpose of its very being is confounded. 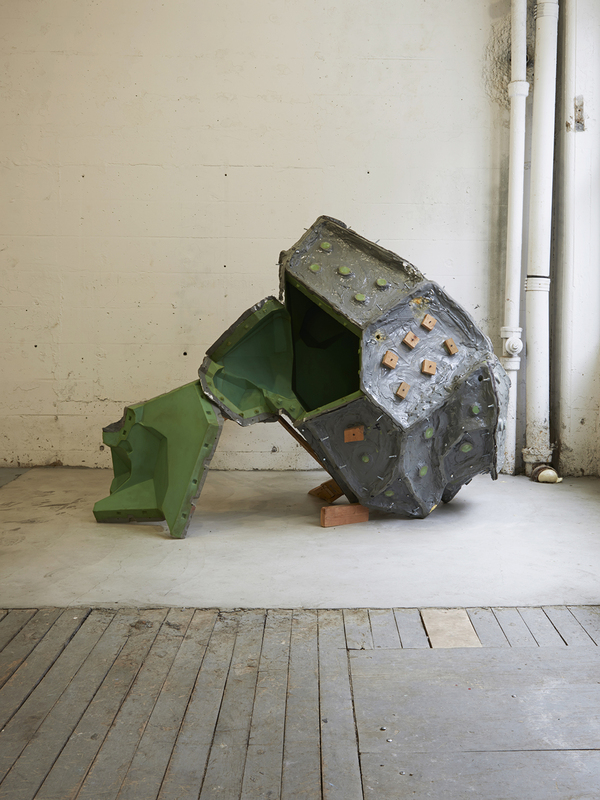 As it is presented in the gallery—seemingly plucked out of a moment in the casting process—this artificial cavity relates back to the natural ones in the earth where such crystals form. It is this dialectic of site/non-site that is often employed in Joo’s works, especially in Megafawn (Extincted), where the dialectic is spatial and temporal as well. Comprised of a urethane cast of antlers of a so-called Irish Elk, it is suspended at eye level by a complex geometry of aircraft cables that merges to two points anchored into the ceiling, similar to the seemingly symmetrical, yet, ultimately irregular formation of antlers. A wrapping of poly film transposes its existence—from Pleistocene to Anthropocene, from bone to urethane, from peat bog to gallery. 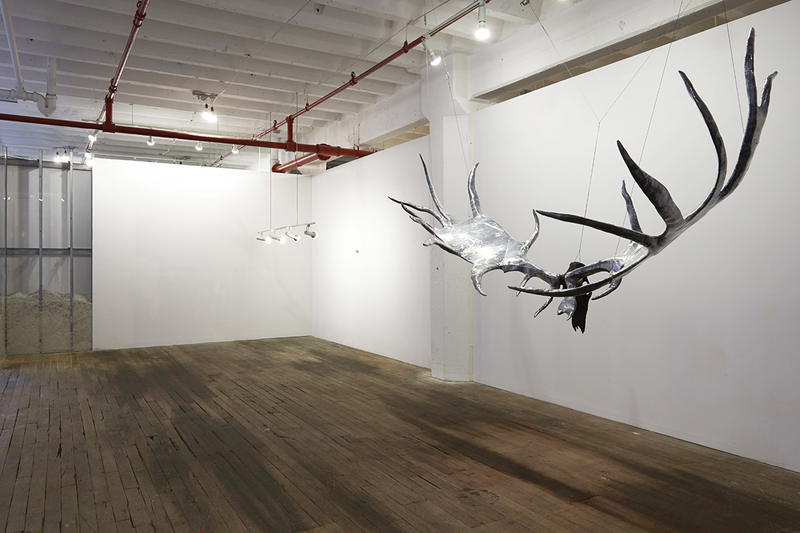 The sole work included with Hurricane Sandy in mind is Parasite (Landscape), because it was installed in Joo’s studio when the flood arrived. Sheetrock gives way to a thick plate of glass revealing heavy aluminum studs, sharply turned 90 degrees from the adjacent portion of the gallery’s wall, the projecting sections secured to the ceiling with threaded rod. From the turn extends two more plates of glass, one on each side of the wall, and then the aluminum studs alone continue as an open frame. The airiness and malleability of this section balances the ominous determinism of the rest of the wall. Contained within the heavy glass sections is road salt. This “waterline” is an addition incorporated into the work only after the flood. The salt continues around the 90-degree turn and recedes into the impenetrable darkness behind the fully-sheet rocked opacity. Within the aluminum studs of the open section are tiny magnets pinning up two small photos, close cropped images of what appear to be one side of a rib cage partially submerged in parched, cracked clay; one photo is oriented as portrait, the other as a landscape. A third magnet—holding no photo—functions as a marker of the active and the potential nature of Joo’s works. Site specific installation by Michael Joo. “Megafawn (Extincted),” 2010. Urethane, polyfilm, aircraft cable, 56 x 108 x 48″. Courtesy of the artist. Photo by Zack Garlitos. The drawing marks in Untitled (Japonensis) are its most prominent gestures. Crane legs cast in urethane and graphite stand on a black shelf and lean upright against the wall where they meet the marks that have clearly been used to draw down from several times their height. A dispersion of the material form, the sinewy marks echo the delicate, graceful nature of the legs. Through continuity of material and color, the work mediates an ambiguous horizon of gravity and weightlessness. The power of Michael Joo’s works is the physical relationships that connect time, memory, and perception. The power of Michael Joo’s works is the physical relationships that connect time, memory, and perception. Through the use of natural forces and phenomena in conjunction with industrial materials, technology, and fine art techniques, specifically formed in space by gesture and placement, and fueled by an unquenchable curiosity—all done with great specificity—systems with momentous gravitational pulls are generated. In the cores of these systems—from which illumination points outward, defying direct observation—the potential reconciliation of interrelated and myriad elements resides.